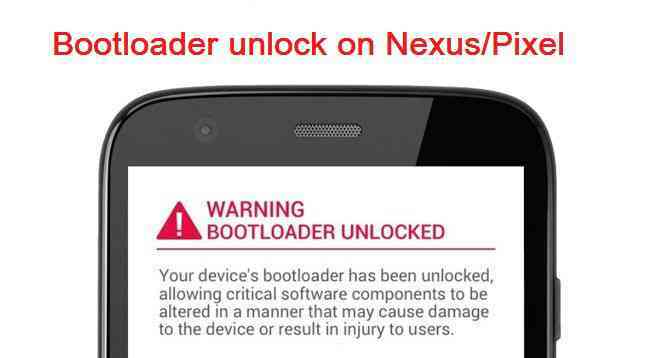 This is an advanced guide meant ONLY for advanced users, which explains how to unlock bootloader on a Google Nexus/Pixel phone. In order to install a Custom recovery like TWRP or CWM or a custom ROM like: Lineage OS, CyanogenMod, Resurrection Remix etc., your Android phone or Tablet’s bootloader needs to be unlocked. This guide may work for other Android phones but this post is only meant for Bootloader unlock on Google Pixel/Nexus devices. Unlockin bootloader on Google Nexus/Pixel phone may VOID your warranty and may delete all your data kept on phone’s storage. Before proceeding further you may consider backup all data on the phone. You are the only person making changes to your phone and I cannot be held responsible for the mistakes done by YOU. A PC with USB driver (mentioned above) installed for your Nexus/Pixel phone [MOSTLY THIS IS NOT REQUIRED IF YOU HAVE INSTALLED ADB AND FASTBOOT UTILITY FROM ABOVE LINKS]. Put the phone into bootloader mode and connect to the PC with a USB cable. – And then connect your phone to the PC using a USB cable.